To maximise rental income in these difficult times, it's vital to find a simple, effective and economical way to publicise what your property has to offer. That's exactly what VillaSeek.com does. You can discover how we do that below, but to find out more, call one of our sales team now on +44 (0)161 8501851, or drop us an email. VillaSeek.com has one simple aim: to get holiday property owners more enquiries, bookings and sales per £ spent than other lettings websites. Our all-in price of £95 (plus VAT, if applicable) for a full year is around half what the mammoth sites charge. We list around 1000 holiday homes worldwide, which means your property faces far less competition than on huge sites where yours could be one of dozens listed in the same area. We concentrate on achieving good Google results on the location-specific searches most people actually make, so more people who view your listing are definitely interested in that area. We further increase traffic by including editorial features, blogs and links on the site. Your property won't face competition from hundreds of desperate last-minute special offers – which increasingly is all some people look at on the biggest sites. We provide links to your own website, which many of the large-corporation sites won't allow. That helps increase the visibility of your own site on Google and other search engines. How is my listing produced? When you book a year's advertising, we will ask you to supply full details, including pictures, for your entry. You're very welcome to write your own advertisement, but many people find it a real chore. So why not take advantage of our free design service? Our experienced writers and designers will create a great advertisement from information in your own website, brochure or simply your notes, suggestions and pictures. We'll send you a link to your listing for you approval and make any changes you require, until it's exactly what you want. Once you've approved it, the listing will go live (and that's when your 12 months begins). You can request changes to your advertisement, including new pictures, at any time. All changes are free – it's all part of the service! The simplest way to pay, especially if you're based outside the UK, is by credit or debit card (we'll take the details over the phone when you book your advertisement). Or you can make a direct bank transfer, or send us a cheque (as long as it's drawn on a UK bank, in sterling). For rental agencies and business advertisers who need to reach leisure travellers and holidaymakers, there is simply no website as superbly targeted as VillaSeek.com. People heading off on holiday are in spending mode. The opportunities are clear, not least in travel services. The no-frills flight revolution has really opened up the market. There are great opportunities for advertisers offering flights and ferries, insurance, car hire and airport parking. 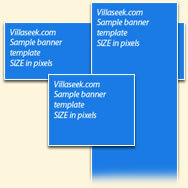 The structure of VillaSeek.com provides plenty of opportunities for precisely targeted advertising. And we're always happy to discuss bespoke advertising solutions. Click here for our standard banner advertising rates.